Late last year I tentatively suggested that R1b-PF6279/V88, also known as R1b1a2, and formerly as R1b1c, may have entered Africa from Iberia, rather than from the Near East as is generally accepted, because of its presence in an Early Neolithic sample from Iberia (see here). This is now looking a lot more plausible due to the recent discovery that the eastern Balkans was home to Mesolithic foragers belonging to R1b-PF6279/V88 (see page 122 here and discussion here) and indeed a pre-Neolithic R1b hotspot (see Mathieson et al. 2017 and González-Fortes et al. 2017). 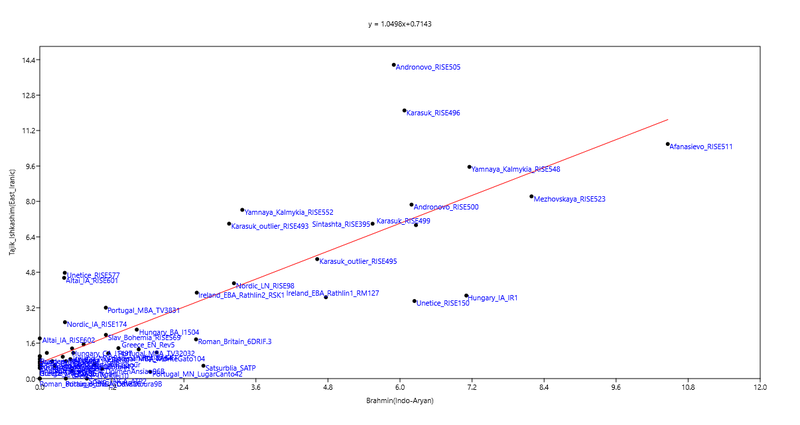 Note also the continued absence of R1b in the growing selection of prehistoric samples from Anatolia and the Levant. So here's a theory that I think is worth considering for the time being: R1b-V88, and perhaps even R1b, originated in an as yet unsampled Balkan population, dating to the Upper Paleolithic and ancestral to the so called Villabruna cluster (see here), that eventually contributed ancestry to all present-day Europeans, as well as many present-day Asians and, via an Iberian route, Africans. Is there any archaeological evidence for the existence of such an Upper Paleolithic group in the Balkans? A popular tactic used by those none too pleased with the presence of Bronze Age steppe or Yamnaya-related ancestry in South Asians is to claim that this ancestry isn't actually from the steppe. Thus, they call it "pseudo-steppe" ancestry. This theory is based on the assumption that a population very similar to Yamnaya formed independently in South Asia, or at least as part of a cline of such ancestry running from South Asia to the Eastern European steppe. At best, this is highly speculative and, at worst, insane; a last ditch attempt to counter mounting genetic evidence backing the Aryan Invasion Theory (AIT), or, if you're politically correct, Aryan Migration Theory (AMT). But it gets traction for the time being, including, unfortunately, among some Indian scientists (see here), simply because of the lack of ancient DNA data points for Central and South Asia. However, we do have Iran_HotuIIIb, a Mesolithic or Neolithic forager from the Hotu Cave near the southeastern coast of the Caspian Sea in modern-day Iran. This location is not in Central Asia per se, but pretty damn close by anyone's standards, because it's next door to the Turkmenistan border. Below is a map that I put together to illustrate the absurdity of the pseudo-steppe theory. Note that Iran_HotuIIIb is located between Yamnaya and present-day Brahmins from northern India, so if you're a proponent of the pseudo-steppe theory you'd expect him to pack quite a bit of Yamnaya-like ancestry, right? Well, he shows a slither, but much less than the Brahmins. How is this possible geographically and temporally, without a migration from the steppe to India some time after Iran_HotuIIIb was alive? Realistically, it's not. The ancestry proportions on the map are based on an easily reproducible ADMIXTURE analysis. The test was run in unsupervised mode, but I designed the dataset to help the algorithm flesh out the so called Early Bronze Age steppe (Steppe_EBA) component. 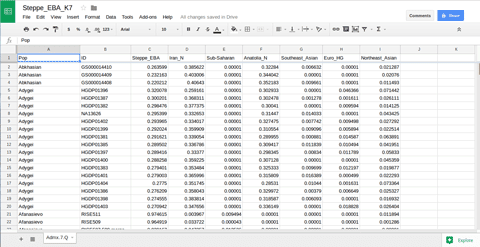 The full Q output is available in this spreadsheet. 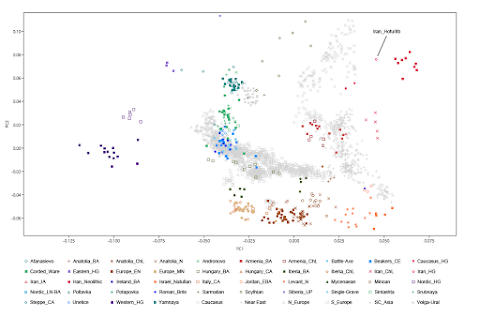 In fact, there are several ways to show that present-day South Asians share relatively recent and direct ancestry with Bronze Age Eastern Europeans, including, for example, with a haplotype test (see here). But I'd say that a well designed ADMIXTURE analysis is an especially effective way of doing it, because both a strength and weakness of ADMIXTURE is that it's sensitive to ethnic-specific genetic drift. Thus, the so called ancestral populations that it infers are often just exaggerated signals of relative inbreeding, isolation, and/or rapid expansions experienced by founders of ethnic groups. 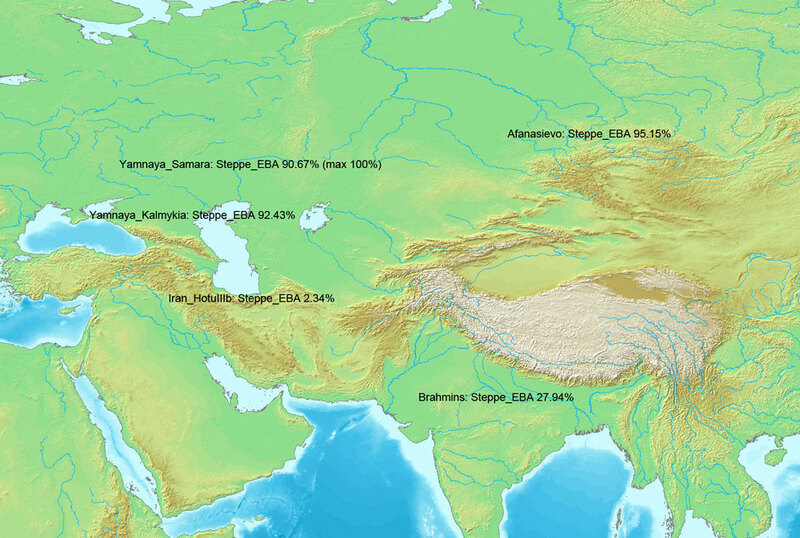 Clearly, my Steppe_EBA component is a signal of a relatively small, young founder population expanding rapidly across and out of the Eurasian steppe during the Bronze Age. That's because it peaks at extreme levels in genetically and archaeologically closely related Bronze Age steppe populations, such as Afanasievo, Poltavka and Yamnaya, and their recent descendants, such as Andronovo, Corded Ware and Srubnaya. In other words, ADMIXTURE has probably managed to pick up the genetic signal of a Bronze Age ethnic group. This signal also shows up at relatively high frequencies in many geographically disparate Indo-European speakers, such as the Indian Brahmins and Icelanders. That's obviously good news for those of us who favor the Eastern European steppe as the Proto-Indo-European homeland. Among the other ancients, those that plausibly can't have ancestry from the EBA steppe because they're too old, it's only seen at high levels in such populations as Eastern European Hunter-Gatherers (EHG), Caucasus Hunter-Gatherers (CHG), and Ancient North Eurasians (ANE). In other words, populations that contributed in a big way to the formation of the Bronze Age peoples of the Eastern European steppe. It's important to understand also that my ADMIXTURE analysis isn't anything particularly original. 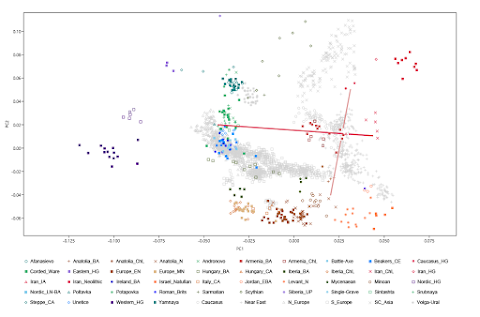 Iran_HotuIIIb shows essentially the same behavior in this standard Principal Component Analysis (PCA) of West Eurasian populations, sitting just south of present-day South Central Asians (SC_Asia). This, of course, is out of whack with geography, and, again, can only be explained by significant gene flow from the north into South Central Asia after Iran_HotuIIIb's time. I spent the morning corresponding with an archaeologist in Kazakhstan. We’re trying to do genetics in the Bronze Age and the pre–Bronze Age variants in Kazakhstan. 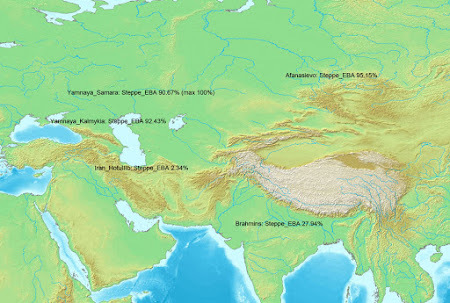 We’d like to characterize the genetic variation in Kazakhstan because it’s a key connection point between the regions south of the Hindu Kush mountains, Iran and India in the south, the steppes in Russia in the north, in China in the East; it’s all mixing up there. And we’re trying to understand the connections. It’s a place of movement and migration, and understanding the genetics is interesting. So that was my morning, and then I spent some hours talking with colleagues today in the laboratory about ancient farmers of Israel and Iran that we have some data from. It looks like this interview was done a while ago, because he's talking about samples from Iran and Israel that have already been published, so I'd say the Kazakhstan data will be part of the upcoming ancient DNA paper on South Asia. The reason I mention this now is because I can reproduce basically the same model using the updated qpAdm methodology described recently in Lazaridis et al. 2017, which relies on a relatively large number (≥16) of ancient genomes/populations as outgroups (see here), and, in my experience, causes many formerly successful models to fail miserably (the taildiff dives from >0.05 to <0.05). 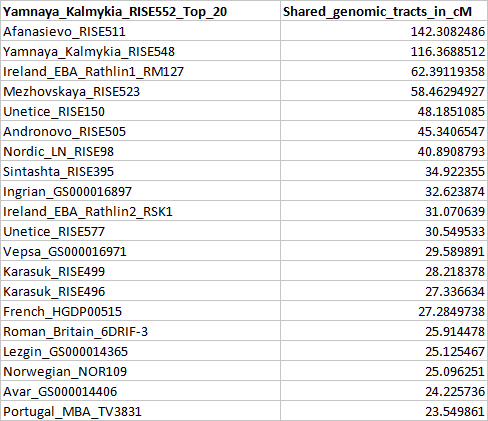 Note that in my dataset Khvalynsk is now labeled Samara_Eneolithic, Kotias as CHG, and Hungary_EN as Hungary_N. Here's a formerly successful model in which Steppe_EMBA (a grouping which includes Afanasievo, Poltavka, Russia_EBA and Yamnaya) is posited as a mixture between EHG and Chalcolithic farmers from the Zagros Mountains in what is now Iran. It clearly fails when I use CHG as one of the outgroups. Abstract: The aim of the paper is to provide the research results concerning the Pit-Grave culture sites of the south Ural region, which is a part of the Volga-Ural interfluve. The Pit-Grave culture developed mostly out of the Khvalynsk Eneolithic culture at the turn of the 5th–4th millennium cal BC. People of the Sredny Stog and forest-steppe Eneolithic cultures from the Middle Volga region also influenced the Pit-Grave culture. The paper considers the radiocarbon data (more than 120 dates), specifies the periodization of the Pit-Grave culture of the Volga-Ural interfluve, singles out the three stages of its development. The chronology of the culture is determined 3900–2300 cal BC. The authors provide new information about the Pit-Grave economy. Paleopedology, palynology, anthropology, metallography, ceramic technical, and technological analyses were used together with archaeological methods to make a more detailed description of the culture. A number of steppe Eneolithic features remained at the Repin stage. The cultural continuity between the Pit-Grave, Khvalynsk, and Sredny Stog Eneolithic cultures was proved by the following features: skeletons in crouched supine position with bent legs to the left or to the right, heads at the eastern sector of burials, ochre coverage with high or low density, multiple burials, egg-shaped ceramics with neck and crushed shell impurity. Technical and technological analysis of pottery was another evidence demonstrating the pottery continuity between the Khvalynsk and Repin traditions (Vasilyeva 2002; Salugina 2005). Big soil burial grounds were substituted by individual burials under the barrow. The spread of local production copper articles was a distinctive feature of the Pit-Grave culture. This was the phenomenon, which archaeologists consider to be the beginning of the Early Bronze Age in steppe of Eastern Europe. 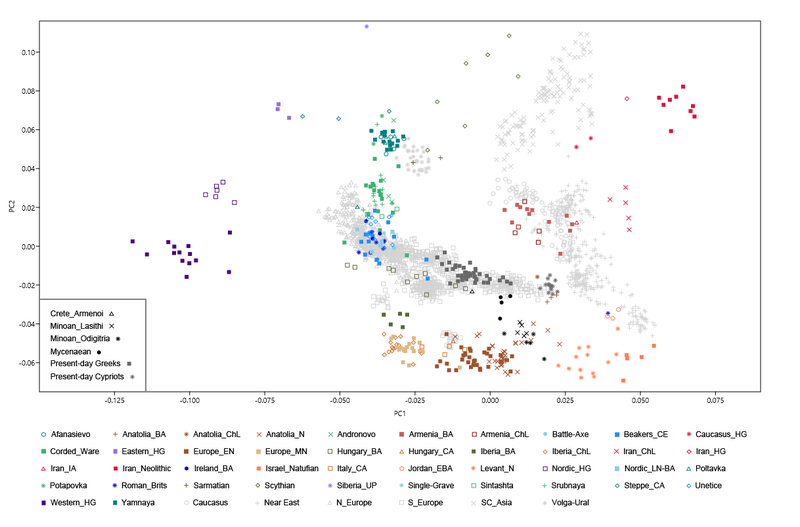 A recurring feature of ADMIXTURE analyses of ancient northern Europeans is the appearance and subsequent dissemination within the Bronze Age of a component (teal) that is earliest identified in our dataset in HGs from the Caucasus (CHG). 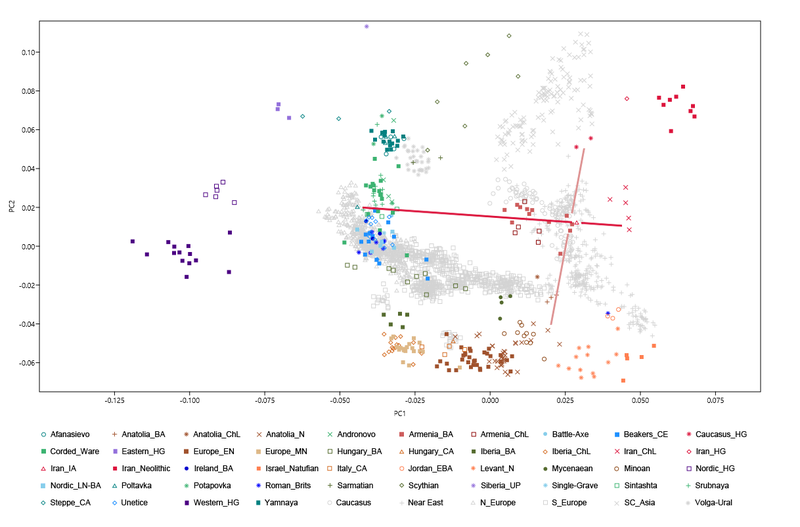 Unlike contemporaries elsewhere (but similarly to earlier Hungarian BA), Portuguese BA individuals show no signal of this component, although a slight but discernible increase in European HG ancestry (red component) is apparent. D-Statistic tests would suggest this increase is associated not with Western HG ancestry, but instead reveal significant introgression from several steppe populations into the Portuguese BA relative to the preceding LNCA (S4 Text, S6 Table). In the present analysis, fineSTRUCTURE has identified the 3 Portuguese Bronze Age individuals as a genetically distinct population (S23 Fig). When compared to Central or Northern European populations such as Ireland , the degree of discontinuity between the Neolithic and Bronze Age in Portugal is not pronounced. However, despite the small sample size we have evidence suggesting complete discontinuity at the level of Y-chromosome lineages with all 3 male Bronze Age samples presenting derived alleles at marker M269. 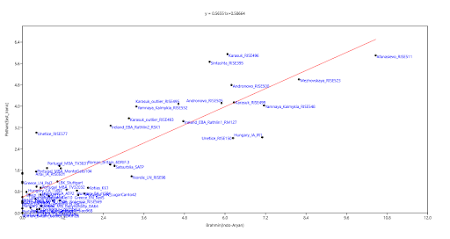 Although in ADMIXTURE analysis we were not able to observe the presence of the CHG-related cluster in the ancestry proportions of the Portuguese Bronze Age samples, with D(Mbuti, X; Portuguese MN/LNCA, Portuguese BA) we find support for CHG/Yamnaya related introgression and also an increase in EHG [Eastern European Hunter-Gatherer] ancestry. 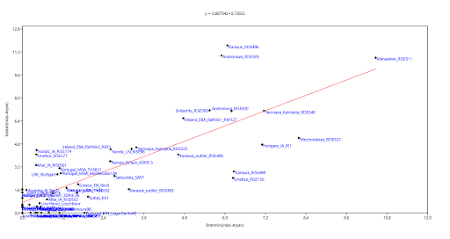 Despite the authors' conclusion that steppe-related admixture was present in their Portuguese BA samples, the ambiguity created by their ADMIXTURE analysis encouraged some heated debates in the comments at this blog and elsewhere about whether their findings were legitimate, and also suggestions that the Portuguese BA R1b-M269 Y-chromosomes were not derived from the steppe. To try and put this debate to bed, at least on this blog, let's run the same samples with the qpAdm mixture modeling algorithm. I don't want to get into the details here about the difference between ADMIXTURE and qpAdm, because I don't feel it's something that I can explain accurately. But, suffice to say that qpAdm is a more direct way of estimating ancestry proportions, so, in my experience, it's less likely to lose minor but significant admixture signals in a well thought out and put together analysis. 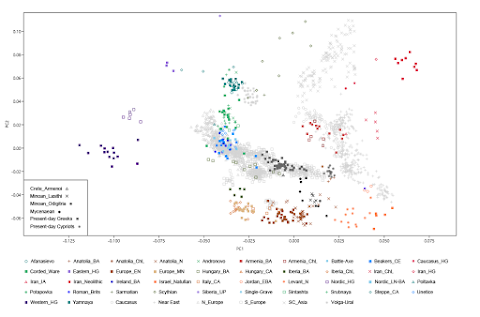 First up, I need to test whether these Portuguese BA (Portugal_BA) individuals can be modeled as a two-way mixture between EHG and Portuguese Late Neolithic farmers (Portugal_LN). Nope, they can't. But what happens if I add CHG to the model? The statistical fit improves, but it's still lousy, which perhaps suggests that I need a temporally more proximate CHG-related reference sample. How about Yamnaya? That's not too bad. But let's try a more proximate Yamnaya-related population: Bell Beakers from Germany. Note that some of these Beakers belonged to Y-haplogroup R1b-M269(P312+), which is the most common Y-chromosome lineage among present-day Iberians. Somewhat better, and we could probably keep going like this, improving the fits each time, with more relevant reference samples if they were available, like, say, late Beakers from what is now France. I suspect also that using more westerly Hunter-Gatherers than EHG, perhaps from what is now Ukraine, might significantly improve the second model. 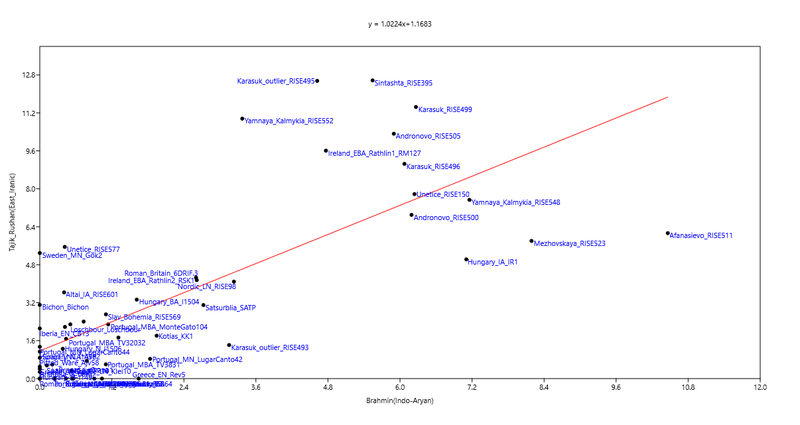 In any case, my qpAdm analysis provides strong evidence that, unlike Portugal_LN, Portugal_BA harbored CHG-related ancestry that was probably mediated via Yamnaya- and Beaker-related groups. 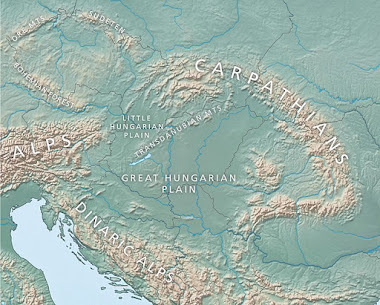 After the recent publication of Bronze Age genomes from present-day Greece and Portugal, you'd have to be a desperate fool not to accept that the Pontic-Caspian steppe in Eastern Europe is the most likely homeland of all surviving branches of the Indo-European language family. I don't want to say I told you so, but, well, I told you so (see here). Yes, we're still waiting for those ancient genomes from South Asia. But don't expect any surprises when they do arrive, probably in a couple of months. Indeed, if you've still got a thing for the Out-of-India Theory (OIT), then it might be time to start looking around for a different hobby than following ancient DNA results. My advice is try meditation. Thus, pending the sequencing of Hittite and other bona fide early Indo-European genomes from Bronze Age Anatolia, which should be able to help pinpoint the Proto-Indo-European (as opposed to just the Late Proto-Indo-European) Urheimat to the satisfaction of most, I suggest that we shift focus in the comments here in a big way, and, instead of wasting time arguing whether the early Indo-European expansions from the steppe happened, we get stuck into the details of how they happened. Worthy subjects of discussion in this context, I'd say, are a couple of intriguing ancient West Asian individuals whose genotypes are now available for download at the Reich Lab website: Kumtepe4 from Chalcolithic Anatolia and F38 from an Iron Age burial at Tepe Hasanlu in what is now Iran. Furthermore, our male Iron Age genome (F38; 971-832 BCE; sequenced to 1.9x) from Tepe Hasanlu in NW-Iran shares greatest similarity with Kumtepe6 (fig. S21) even when compared to Neolithic Iranians (table S20). 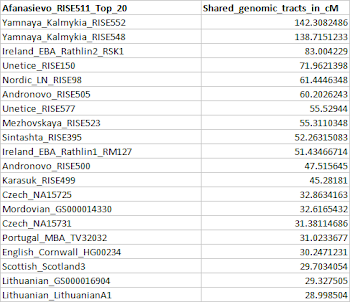 We inferred additional non-Iranian or non-Anatolian ancestry in F38 from sources such as European Neolithics and even post-Neolithic Steppe populations (table S20). Consistent with this, F38 carried a N1a sub-clade mtDNA, which is common in early European and NW-Anatolian farmers (3). 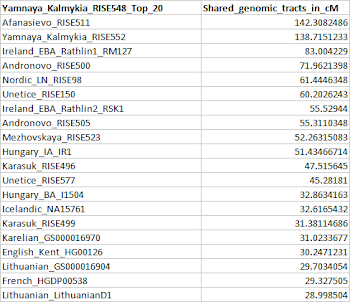 In contrast, his Y-chromosome belongs to sub-haplogroup R1b1a2a2, also found in five Yamnaya individuals (17) and in two individuals from the Poltavka culture (3). These patterns indicate that post-Neolithic homogenization in SW-Asia involved substantial bidirectional gene flow between the East and West of the region, as well as possible gene flow from the Steppe. In other words, it's almost certain that F38 had recent ancestry from elsewhere than the South Caspian region, and probably from the Pontic-Caspian steppe. However, interestingly, when F38 was alive, Tepe Hasanlu was more likely to have been an ethnically Hurrian or Urartian site, rather than an Iranian one, and the Iron Age settlement there has a fascinating and tragic final story (see here). Also, F38 shows a great deal of genetic similarity to three Early Bronze Age (EBA) samples from Kura-Araxes culture burials in what is now Armenia (labeled together as Armenia_EBA). 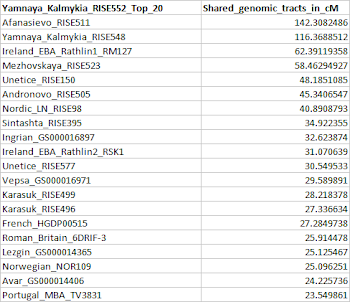 Indeed, one of these Kura-Araxes individuals belongs to Y-haplogroup R1b, albeit to a different subclade than F38. Moreover, Kura-Araxes people are hypothesized to have been early speakers of Hurro-Urartian languages. Like four peas in a pod, right? Not necessarily, because this outcome might be a simple coincidence. And, in fact, that's what my qpAdm analysis suggests. 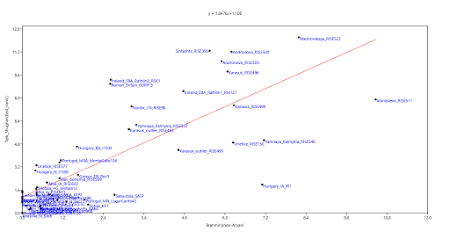 Using no less than 16 ancient outgroups, I found that the models below produced the best fits. Obviously, Anatolia_BA stands for Anatolia Bronze Age, CHG for Caucasus Hunter-Gatherer, Iran_ChL for Iran Chalcolithic, and Tepecik_Ciftlik_N for Tepecik Ciftkik Neolithic. Admittedly, a more systematic and exhaustive search might be able to dig up even better fitting models and show that F38 does share recent ancestry with Armenia_EBA. 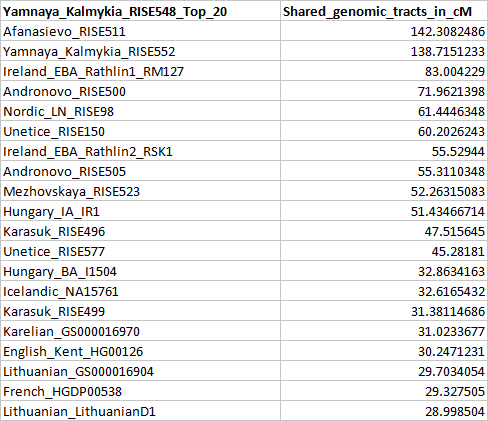 But in any case, after running these tests, I'm now certain that F38 had significant admixture from the European steppe, probably via a population very similar to Poltavka_outlier. On the other hand, I'd say that if Armenia_EBA had any steppe ancestry, then it's only a few per cent, and likely from a less northern-shifted source than Poltavka_outlier. This is what the 2-way models look like on the same PCA as above. Armenia_EBA and F38: so similar, yet potentially so different. F38's probable steppe connection, of course, suggests that he was at least partly of Indo-European origin, and possibly a speaker of an Iranic language, because the Poltavka culture has been associated by some scholars with early Indo-Iranians. - Was F38 an Hurro-Urartian or Indo-European, or an Hurro-Urartian with some Indo-European ancestry? If Indo-European or partly Indo-European, then what type? Armenian, Cimmerian, Iranian, or...? - Is F38's R1b1a2a2 lineage a reflection of his potential Poltavka ancestry from the steppe or Kura-Araxes ancestry from the Caucasus? - What explains F38's strong affinity to many modern-day European groups? - Does the southern, non-Eastern European Hunter-Gatherer (EHG), part of Yamnaya's ancestry perhaps derive from a Bronze Age South Caspian population closely related to F38 and rich in R1b1a2a2? Nah, I'm just trolling with that last one. I thought I'd save some of you the trouble. Let's be honest, what are the chances that this will ever pan out? I'll give it a probability of 5%. Adding to the number of questions was the fact that the AMMD project also recorded hundreds of small campsites, particularly in the northern distal reaches of the fan, that bore ceramics [my note: called Incised Coarse Ware or steppe ware] unlike those of other Murghab communities, but with unmistakable affinities to the so-called Andronovo cultural group occupying regions to the north and east during this same period (Cattani, 2008; Cattani et al., 2008; Cerasetti, 2008, 2012). These campsites are interpreted as representing the influx of a new socio-cultural group of mobile pastoralists who began to occupy first more remote areas and gradually move toward more physical and subsistence integration with settled farming groups in the Murghab (Cerasetti et al., in press; see also; Rouse and Cerasetti, 2014). However, the question of whether such encounters upset a careful ecological balance struck by Murghab farming settlements for over a millennium, or whether they were merely coincidental with environmental changes, could not be sufficiently addressed with the coarseness of survey data; targeted research agendas were (and are) still needed to address such questions specifically. Nonetheless, up to this point, it is clear that at the end of the Bronze Age, major social, demographic, and environmental changes were coinciding. Southern Turkmenistan is, of course, not too far away from South Asia, which was also potentially a target of large scale Bronze Age migrations from the Eurasian steppe that may have brought Indo-European languages to the region. Archaeological evidence of such population movements into South Asia is, for now, apparently minimal or, as some claim, even non-existent. However, ancient DNA evidence in favor of the so called Aryan Invasion or Migration Theory (AIT/AMT) is rapidly building up (see here). By the way, if you're wondering about the title of this post then this might help: "Kossinna's Smile" (Heyd, 2017). The BEAGLE analysis that I foreshadowed a couple of days ago (see here) is finally done. The output is available for download as a matrix of shared genomic tracts in centimorgans (cM) here. I haven't yet had a chance to look at the results in detail, but I'd say that the outcomes for the three Early Bronze Age (EBA) Afanasievo and Yamnaya individuals make a lot of sense. 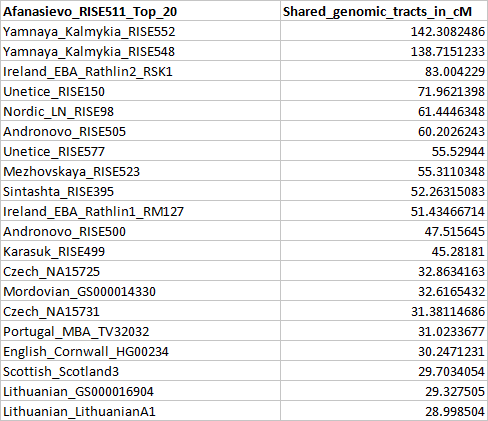 The high affinity that these individuals show to the Irish EBA samples is not at all surprising, but striking nonetheless. The Afanasievo people, after all, lived in the Altai Mountains deep in Asia, more than 6,000kms from Ireland. 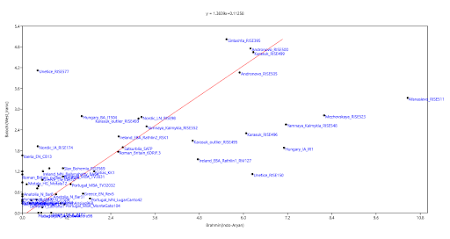 Update 02/08/2017: Interestingly, the graphs below, based on the cM values in my coancestry matrix, suggest that upper caste Indo-Aryan-speaking Brahmins from Northern India share relatively more ancestry with the Afanasievo genome than Iranic-speakers such as Pamir Tajiks, who generally share relatively more ancestry with the younger Andronovo and Sintashta samples. The relevant datasheet is available here.